I’ll admit to being a little skeptical about this course when I first heard about it. I’ve sat in on a number of seminars covering this topic over the years, and frankly I didn’t really think it was a suitable subject for a standalone course. I thought it was just too simple, too cut-and-dry. Well, I was wrong! It didn’t take me long to realize that this course was going to go well beyond my expectations, taking the most comprehensive view I’ve ever seen of interacting with law enforcement. It’s more than the “keep your hands on the steering wheel and say this” you typically find in books and articles. Interactions With Law Enforcement While Armed is a very complete look at the topic, comprising over two hours of video presentation by host Rob Pincus, several PDF worksheets, a handy checklist for what to do during a traffic stop, plus a sheet for class notes. If there is one overriding theme in this course, it’s understanding how the police do their jobs and how they respond to the armed private citizen. Knowing how and why law enforcement officers do what they do is incredibly important to a successful outcome in your interaction. Although he downplays this, Pincus has significant experience as a police officer himself and approaches the topic with a deep understanding of both the officer and the armed citizen. Pincus starts by pointing out that there are really two kinds of interactions with law enforcement: those you expect, because you did something or are involved in something which attracts a police presence; and those you don’t expect, like getting pulled over without notice. Your level of expectation is likely to affect how you deal with the officers, and understanding that is an important part of being prepared. He then jumps into an explanation of why your overall behavior, starting with your decision to carry a defensive firearm, affects how you’ll interact with the police. That includes activities that you choose to engage in; as he says, “make life choices that will keep you as safe as possible without violating the law.” He points out the need to thoroughly understand the laws where you are, which is particularly important if you’re traveling. It’s your job to keep up on the laws where you live and where you’re visiting! Part of this module deals with the sometimes subtle differences in shall issue, may issue, and “Constitutional carry” provisions that might factor into the police attitudes in the area. He also covers how alcohol affects your legality to carry, and how the serving of alcohol in the vicinity may impact the legality of your firearm — thus increasing the chances of dealing with law enforcement. As I said, this course is really comprehensive — and he’s just getting started! One segment deals with the firearm you have staged in your house and how responding officers might react. For instance, officers might respond to your house because of a noise complaint you made; they might not be expecting that shotgun propped up in the corner, and it’s likely to change how they interact with you. Again, this is about understanding the police officer’s job and why he or she might be very concerned about a gun in the open in your home — even if it’s absolutely and completely legal to do so. As he points out, just because it’s legal doesn’t mean it’s always a good idea or that it won’t color how the officer responds to you. Letting the officer know before they discover it on their own says to them that you’re not hiding anything with the intention to harm them. It may very well de-escalate the situation. Pincus is very thorough, covering all of the plausible scenarios in which a police officer might be in your home or workplace and the various kinds of responses you might get when the officer finds out there’s a firearm in the open. For each scenario he provides an approach designed to both protect your right to self defense and allow the officer to do his or her job safely. Preventing emotion-based escalation, on either side, is a primary topic in each of the modules. One of the bigger modules deals with firearms in vehicles. He points out the vast majority of these kinds of interactions are usually due to a traffic stop, which is a tense situation for all parties involved. In this module Pincus brings in some role-playing videos with a concealed carrier and an actual police officer. These videos cover a range of circumstances and show how each party contributes to a successful outcome. This module alone could be a complete course. 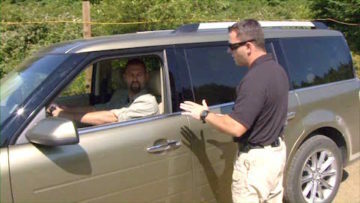 A separate module covers the unique situation of having a firearm in the vehicle but not on your person and how that affects what you say and do — as well as the officer’s responses. One module covers the “best practices” for concealed carry, including how to avoid the “printing” that could attract the interest of an officer, as well as some thoughts on open carry. Still another modules details the unique case of how to approach a police officer for help when you’re armed, which is a potentially hazardous event made substantially safer through your informed actions. The longest module — 40 minutes — covers how you should interact with police after a defensive gun use. Pincus and his guest experts explain how to handle the conflicting needs of protecting your rights while also giving the officers the information they need to establish your innocence. Whether you’ve actually had to shoot or not, Pincus goes through all of the important points of staying safe when law enforcement arrives. This includes how to correctly behave when the police are yelling conflicting commands in what is probably a very volatile situation. This module is, in my opinion, the most important in the course and Pincus covers it as thoroughly as I’ve ever seen. Like the vehicle module, this could be a course on its own. I cannot over-emphasize the value of this module. This course covers more information than I originally thought it would and does a particularly good job of integrating every part of defensive firearm use. Setting yourself up for success, from how you carry to how you respond to questions, is what the PDN Academy Interactions With Law Enforcement While Armed online course is all about. I believe everyone, whether carrying for years or just hours, will learn something valuable from it. Yes, it’s definitely worth the money and is going on my recommendation list for all concealed carriers. Hey Buddy!, I found this information for you: "Review of PDN’s new online course: Interactions With Law Enforcement While Armed". Here is the website link: http://www.grantcunningham.com/2017/03/review-pdns-new-online-course-interactions-law-enforcement-armed/. Thank you.